Qantas chief executive Alan Joyce says he expects the proposed Jetstar Hong Kong franchise will be granted a hearing by the local government in early 2015. Jetstar Hong Kong, which was launched in 2012, is yet to secure an operating licence and has been forced to sell aircraft and park others while it waits to find out if it will be given the right to fly with access to local traffic rights. “We are expecting a hearing in the early new year and that process is then determined by the Hong Kong authorities,” Joyce told shareholders at the Qantas annual general meeting in Melbourne on Friday. “We are confident that Jetstar Hong Kong’s case is solid for the approvals. Jetstar Hong Kong, a partnership between Qantas, China Eastern and Shun Tak Holdings, has met fierce opposition from local carriers Hong Kong Airlines and Cathay Pacific, who argue the proposed airline does not meet the principal place of business requirements contained in Hong Kong’s Basic Law given all major decisions will be made by Jetstar’s Melbourne head office. 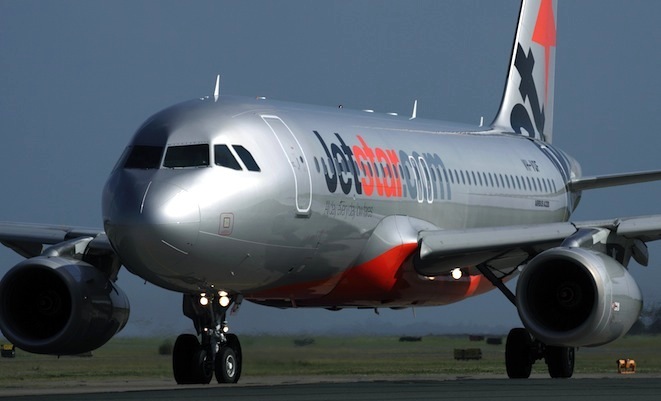 Faced with lengthy delays in getting off the ground, Jetstar Hong Kong has sold six A320 aircraft that were delivered from Airbus, with three others sitting on the ground in Toulouse accumulating storage fees and leasing charges. Joyce said Qantas’s A$30 million investment in Jetstar Hong Kong “hasn’t been used”. “The business is still functioning on that money along with the other two shareholders who have put their equivalent to that,” Joyce said. Jetstar Hong Kong has argued that it has local management, a Hong Kong chief executive and is run and managed by a separate board. That is correct. We have fixed the error. Thanks Chensy.